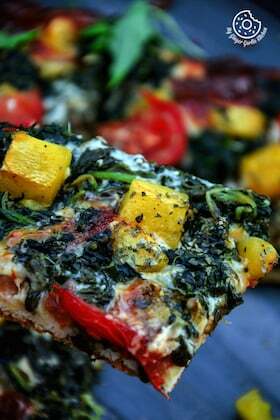 This veggie pizza pie is a great twist on a regular pizza. 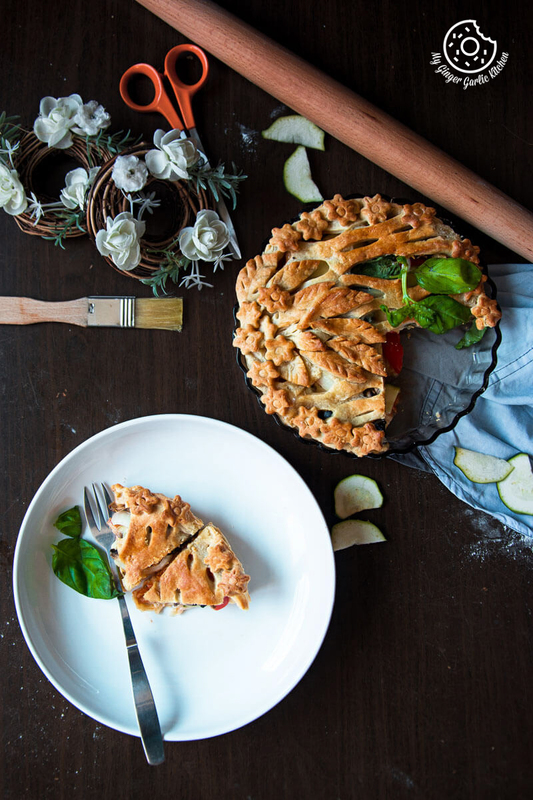 This combines our cravings of pie with our unquestionable obsession with pizza! Pizza + Pie = the most desired and awesome combination ever. 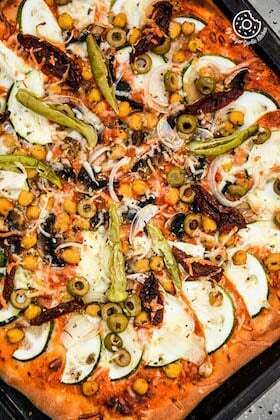 This veggie pizza pie is a perfectly crispy, flavorful, and mouthwatering pizza that you can’t get enough of. Is it the time to indulge in some pizza? I think it is. Pizza can happen any day: Speaking of pizza, usually, Friday night is pizza night at my home. I already told you about it in earlier posts. Here: chickpea mushroom pizza and whole wheat pizza. But this time, I am sharing a yummier and more beautiful pizza which we had last Wednesday. See, I told you pizza can happen any day. 😉 I must say this is one of my favorites pizza dishes. How it happened: This veggie pizza pie first happened at a moment when I had an urge of baking something rich, delicious in form of a pizza. But then realized I didn’t have any pizza dough at home and I wasn’t in the mood for making it. However, I had some pie dough. Then I made this pizza pie which is one of its kind, and the magic happened in terms of a delicious pizza pie. It was rich and pretty splendid in looks and taste, exactly what I was looking for. Guests coming over and you need a failsafe dish? What do you do when you have the guest coming over for dinner over a short notice? I usually bake a pizza. Baking a pizza always fits in the situation because everyone loves pizza and you can blindly go for it. Isn’t it? Simple, quick, easy, undeniably delicious and dinner friendly. I’ve made this pizza pie already a couple of times when we had friends for dinner. 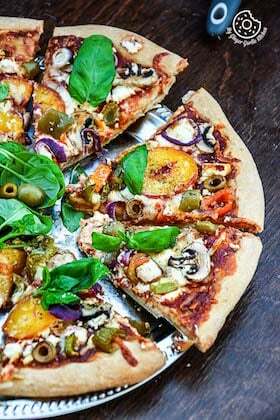 Pizza comes to the rescue: If you also make this pizza pie when you have guests coming over then get ready to hear some awesome words as your admiration. They wouldn’t stop praising you and would ask for a tutorial on how you made it. Well, it has happened to me a couple of times and my friends have been asking for the tutorial. Then I thought I sure should share a video on this simple yet elegant pizza pie. So here I am with the tutorial. I sent this to my friends already and they are loving it, and I hope you guys would love it too. 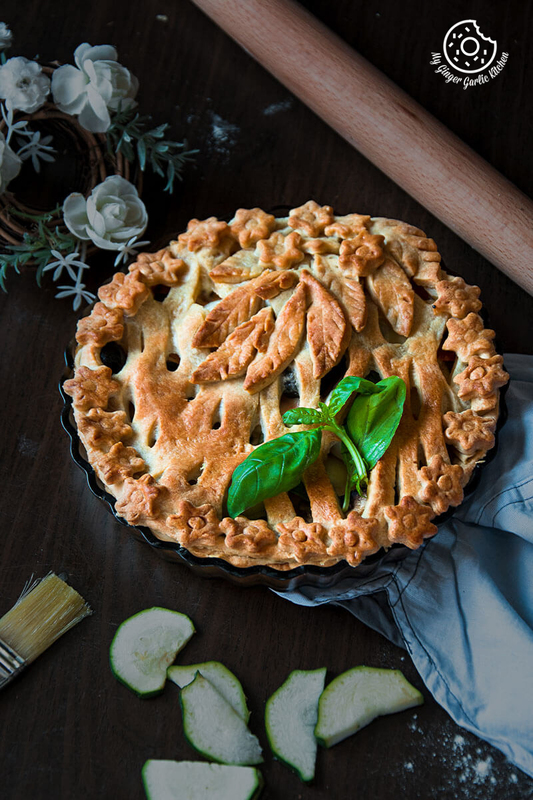 Pizza + Pie: Imagine yourself devouring a blend of a classic pizza and a pie. This pizza pie is a great twist on a regular pizza. 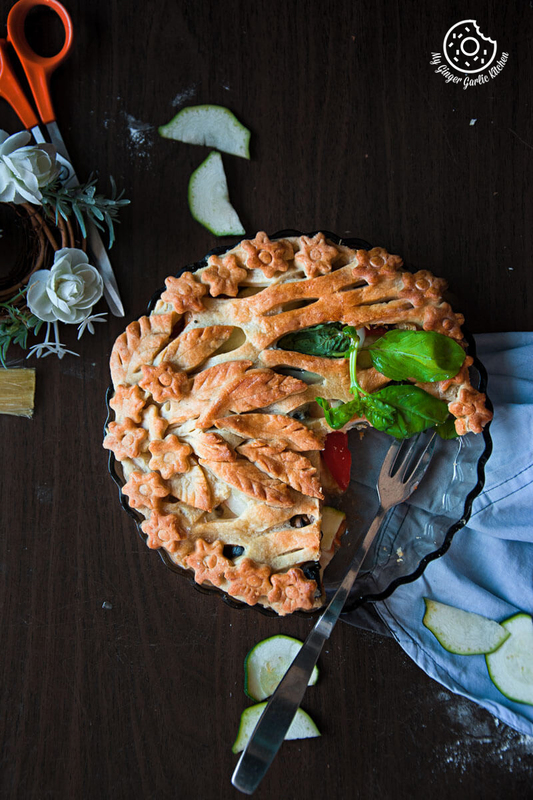 This combines our cravings of pie with our unquestionable obsession with pizza! Pizza + Pie = the most desired awesome combination ever. You don’t need anything flashy: No fancy tools or skills are needed to make this pizza pie. A simple cookie cutter, skewer, and a knife can do wonders. They can be your best friends when it comes to making this veggie pizza pie. Not to mention that you can go with a variety of toppings. 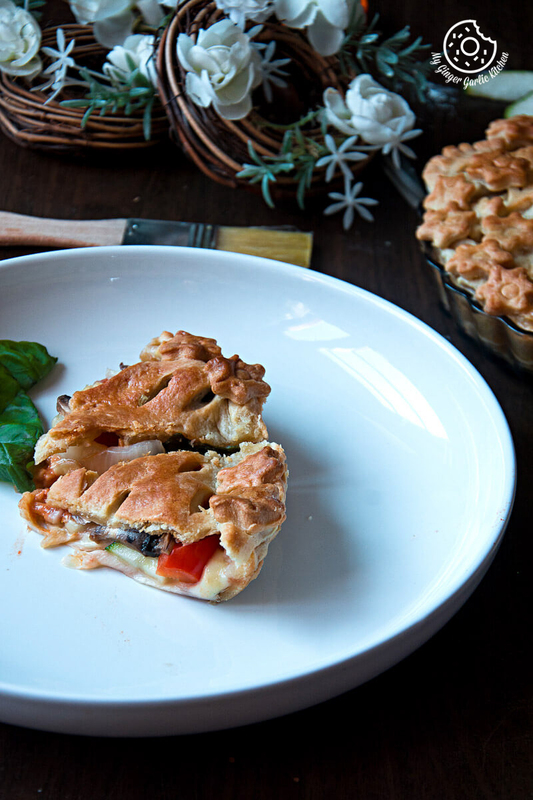 You will only need these: This veggie pizza pie needs refrigerated unbaked pie crust. 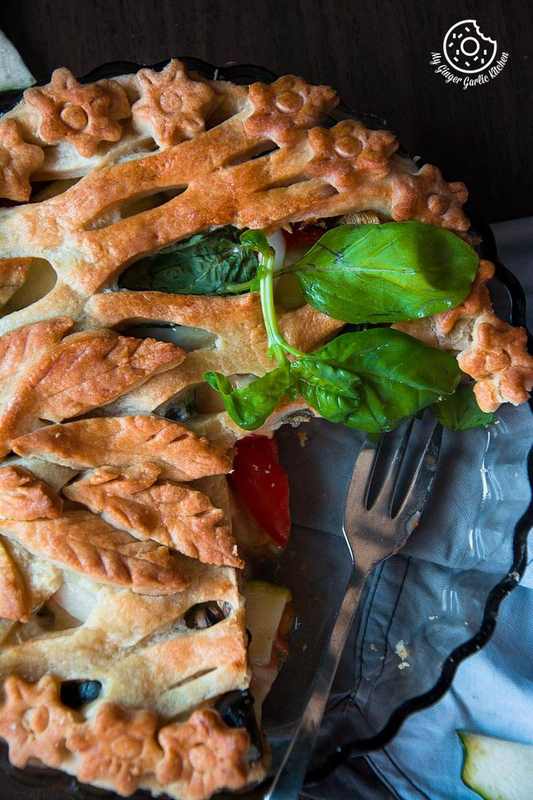 This pie crust is then filled with mushrooms, bell peppers, zucchini, basil, olives, and cheese. For me, this is best served as a dinner along with some red wine. And you can also serve it as a breakfast for the next day if you have any leftovers. Some interesting pointers about this pizza pie: This pizza is baked in a pie pan. Bake the crust for a while before adding the fillings, this would save this pizza pie from getting soggy. This pizza pie has a thick crust which would remind you of a pie. And the cheesy goodness along with pizza sauce would surely make it resemble a pizza. Attention: This is a perfectly crispy, flavorful, and mouthwatering pizza that you can’t get enough of. 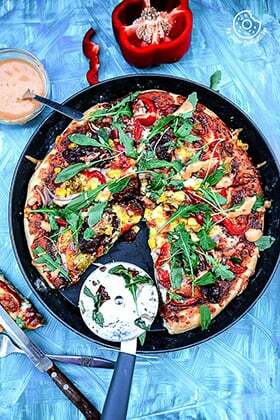 Watch Veggie Pizza Pie recipe video below (please wait for a couple of seconds for loading). Roll out 150g pie crust. 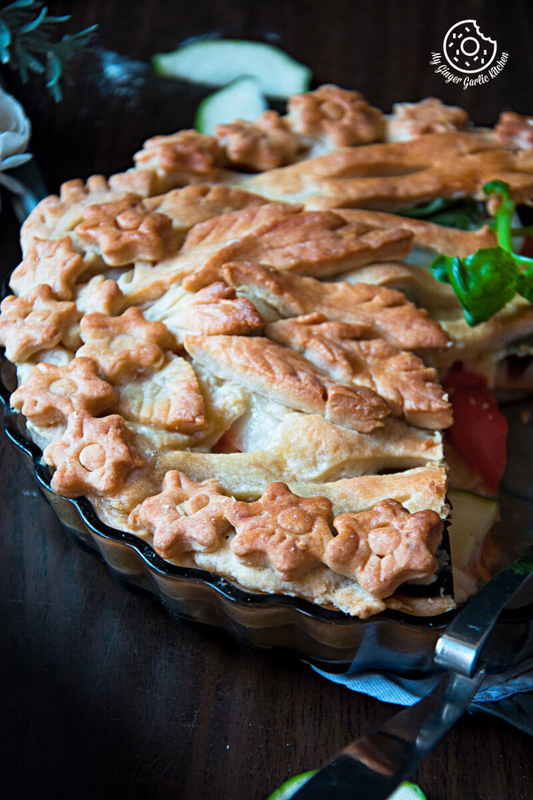 Arrange in a pie pan and trim the edges. Prick with flour and bake for 10 mins. 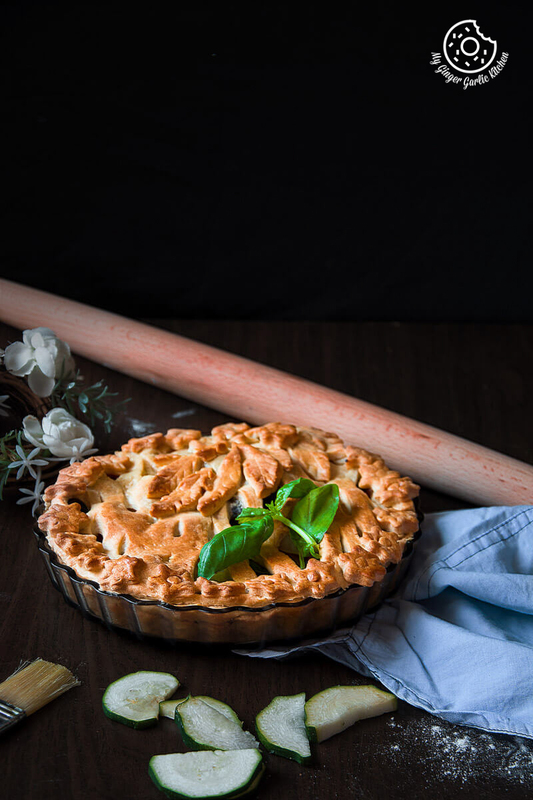 Top pie crust with pizza sauce. Add cheese, zucchini, onions, mushroom, bell pepper, black olives and basil. Finish with more mozzarella cheese on top. 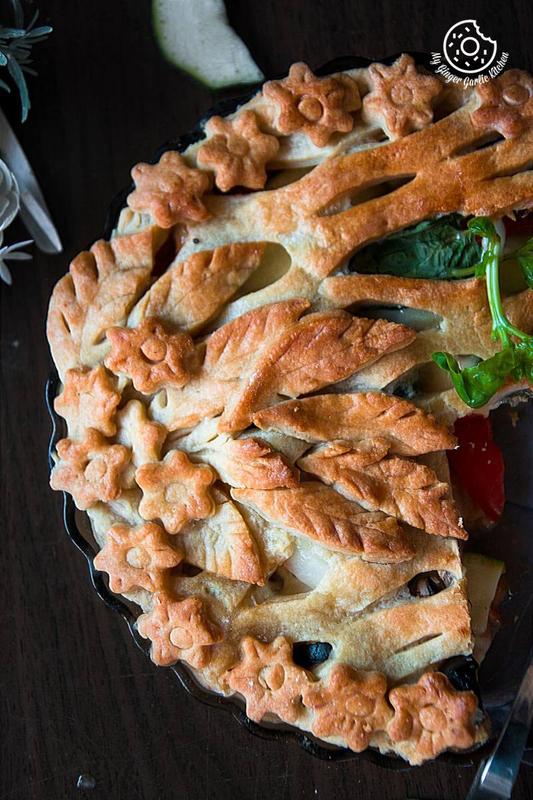 Roll 100g pie crust and cut into 10-12 leaves with the help of a knife. 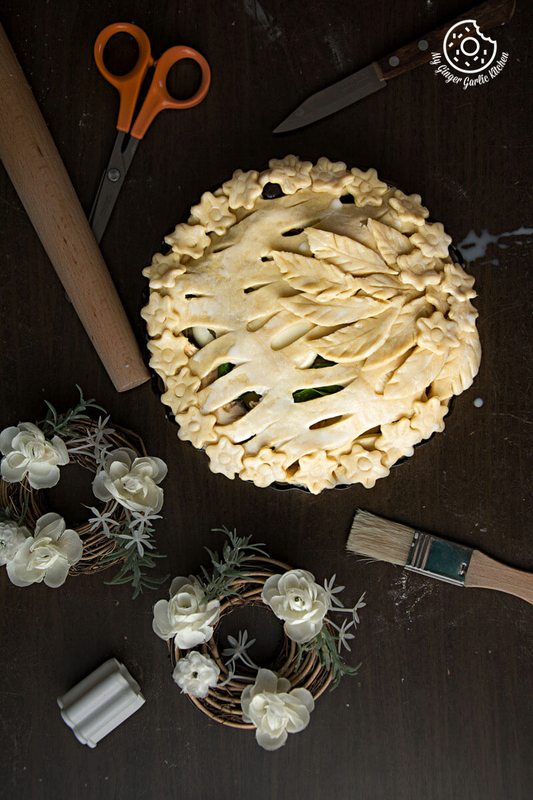 Roll other 100g pie crust and cut with cookie cutter into 25-30 flowers. Craft them into flowers with the help of straw and a skewer as shown in the video. 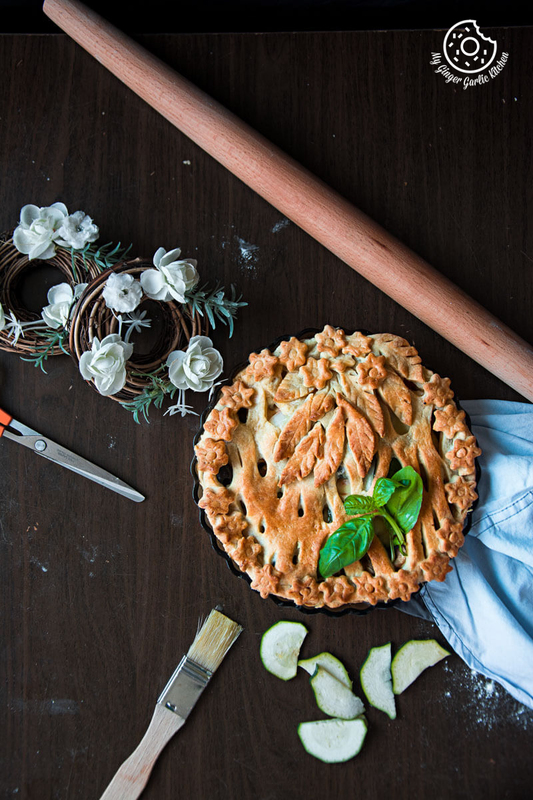 Roll another 100g pie crust and make diagonal slits on it with the help of a knife. Bake in 200°C pre-heated oven for 8-10 mins or until the top is lightly golden. Drizzle with some pepper sauce and sprinkle some pepper and oregano.